Do you expect the Police to save your life? After the recent press about the death of Jordon Lyon, I think people need to ask the following question. Now it might not seem that hard, but I have the view that the Police are there to protect and the same goes for the PCSOs. If it was two lifeguards, yes I would be asking why they didn’t jump in, but these were two fully clothed PCSOs. It might be “human nature” to jump in, but what if the two officers couldn’t swim? I’m not the best swimmer and I remember all those years ago jumping into the swimming pool in Hemel with my pyjamas on and trying to pick up a brick, and I remember not being that good at it. Would I not be putting both the life of the boy and mine at risk if I tried a rescue? And then if I had a radio which had direct access to those that could help, would it not be better for me to use that? What if it was a burning building instead, would you expect a PCSO to run in, or wait for the Fire Brigade? It seems that the media like to question the roles of the PCSOs, however I know that the team we have for Park Ward in Lincoln do a great job and are welcomed by the community. So lets stop putting them down. ps, we keep being told how the boy drown in a pond. Now I’ve seen the pictures and that is not a pond! A pond is a small water feature in your garden, this was a 6ft deep football pitch sized lake. Last night for about 3 minutes Heather and I were on Five Live, where she said that marrying me might not have been the best choice! You can listen again here any time this week, and you’ll need to skip to around 2h56m. 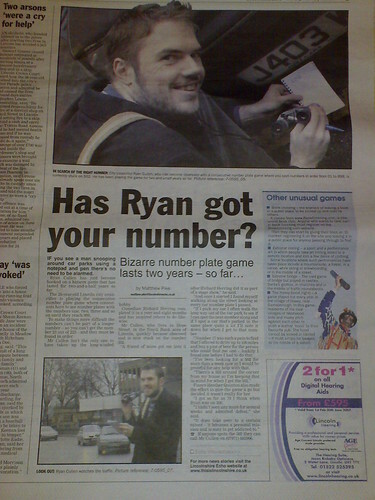 Somehow missed this one the first time around so can’t be sure if it actually made it in to the print edition, but the Daily Mirror website has Thin Edge of the Reg for Ryan dated 27th Feb. If it did manage to make it in to print, this would be my second time, the first where I was called “sick”. 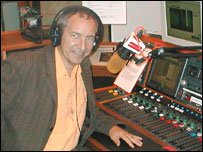 I’ve just come back from the studio of Radio Lincolnshire where I’m one of the main features of the Breakfast show. After getting readers of the Echo to help me out, I’ve now got the listeners of the local radio. You can listen again today once the show finishes via the stations website. I’m in the Lincolnshire Echo again. Second time in seven days! Something to do with my slight obsession with number plates. 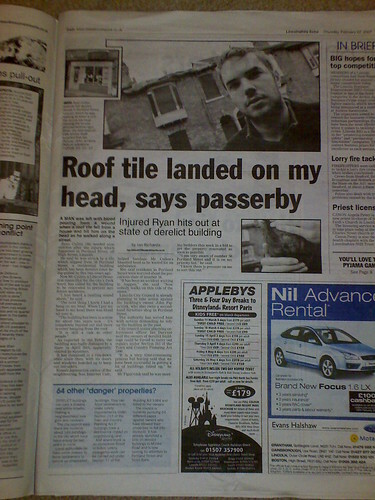 Today’s Echo has an article about the me being hit on the head. 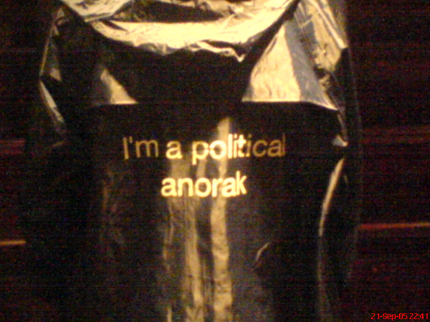 The BBC today called me an anorak, of this I am proud. It at least shows that they are either reading my blog, or more likely my LibDemBlog site. One internet blog from a conference visitor – if not a windup – details the excitement he experienced driving to conference. Nope it’s not a windup, if the journalist wants to follow my progress, top right of this page shows how far I’ve got, alternatively my CNPS tracker site will help. How on earth can Charles Kennedy compete with that once-in-a-lifetime experience. Hopefully it won’t be a once-in-a-lifetime moment, as I’ll beat that “record” before I finish. As for Charles, I’m sure the birth of baby Douglas would easily compete. Thanks to Will for the tip-off. Just a shame the BBC didn’t link to me! Now whilst I think that I might have been called sick once before, a national newspaper is a first for me (and on page 2!). Chris Bryant MP seems to think that an item which I designed and sent out to student branches 15 months ago is newsworthy. Now I can understand why people might think that I’m “poking fun at David Blunkett’s blindness”, but I wasn’t. I spent ages researching what an ID Card would look like and a year ago these were the stories that were on the BBC Website Plans for ‘£40 ID cards’ and Blunkett pushes ID cards debate. Back then, we were all led to believe that ID Cards would be an all-in-one card, which would replace your passport and driving license. Now as we have EU standardised driving licenses, the belief was that ID cards would look similar, but would differentiate between those who could drive, those with a provisional license and those who can not drive. 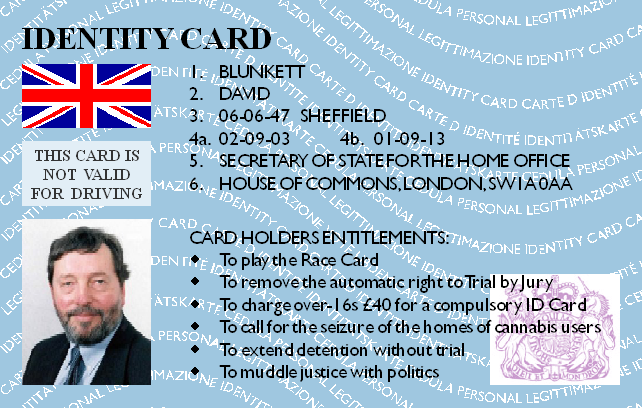 However since Blunkett changed his mind last week, and now you’ll need a driving license, a bio-metric passport and a bio-metric ID card, I’m guessing that the design will be slightly different. On another note, I like the fact that Chris Bryant said “Everyone knows the young Lib Dems want to legalise drugs and Kennedy hasn’t the spine to take them on.” I was under the impression that we lived in a democracy, and one of the great things about the Liberal Democrats, is that it lets it’s members, local parties and the youth wing make policy. In fact this is exactly what Peter Hain was calling for in the Guardian back in March.